Skin tags are small, benign pieces of skin that are usually connected to the underlying skin. They are fleshy and skin-colored growths that can appear anywhere on the body, at any time. However, they typically do not cause any pain or other discomforts. The effects of skin tags are primarily cosmetic, and for these cosmetic reasons, many of us have considered getting rid of skin tags at home with a scalpel or scissors at some point. Despite skin tags being a common occurrence among many adults, we really don’t know that much about them. Around half of all individuals will get skin tags at some point in our lives, and they tend to appear more often when we get older. As a result of the widespread annoyance that these skin growths cause, the number of useful over-the-counter skin tag treatments has increased significantly. Fortunately, large skin tags aren’t that common, but there are exceptions. In most cases, they are a few millimeters in size and won’t grow much larger. As a result of their size and coloration, they can often be misidentified as warts and other benign and malignant skin conditions. Don’t hurry to your doctor (who knows them as acrochordons) because you have one – your health is not in any danger. Skin tags are benign tumors, which means that they pose no threat to your health, either now or in the future. If you’re skeptical that this is the case, then look up the procedure to remove them – they are so harmless that they’re considered a cosmetic issue rather than a medical procedure. 1.2.3 Is It Safe To Cut Off a Skin Tag? While skin tags are typically harmless, there may be times that you find yourself worrying a bit more than you should about these pesky skin invaders. Maybe you started seeing these growths begin to pop up on your skin and you aren’t entirely sure they are just skin tags or cysts; this is when it is a good idea to visit your doctor for a proper diagnosis and to rule out a more serious condition like skin cancer. Skin cysts, also known as epiermoid cysts, are small sacs that form under the skin. These small sacs then fill with keratin, and like skin tags, they can develop anywhere on the body. If you notice these skin growths, then you should get them checked to rule out any serious medical conditions that may need treatment. Most of the time, however, it is found that these small growths are benign cysts, but there is still a chance of a malignant tumor. When it comes to skin tag treatment and removing skin tags, many doctors will tell you that they prefer to numb the area and then snip off the offending skin tags. However, if you attempt this treatment at home yourself, you can get an infected skin tag if you cut them without due care. 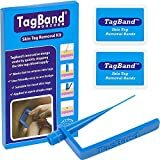 While we don’t recommend that you cut off skin tags at home due to the possibility of infection and scarring, we do recommend that you use the TagBand removal kit for safe at home skin tag removal. With this kit, you’ll be able to tie off a skin tag, and you will see results in about a week without experiencing any pain. Why risk harming your skin by using any other removal method? If you do decide to proceed with other at home removal methods that do not include the TagBand kit we have recommended, then read further for some good practices to follow and other useful information about removal. Also, if you are not one hundred percent certain that the growth is a skin tag, you should not treat them at home and instead you should see your dermatologist for a proper diagnosis. Cutting off a skin tag is often considered a viable option by many people because it is a benign skin growth and it is harmless. This removal process, however, shouldn’t be performed for any other common skin ailments, including warts. Safety should be your top priority when performing the treatment yourself. Wash/sterilize your hands (and skin tag area) and let them dry off. As an extra precaution, apply some rubbing alcohol to the area you will be treating. Sterilize the scissors or scalpel you will be using by placing them in boiling water for a few minutes or rubbing them with alcohol. It will sting when you remove the skin tag, but the sensation can be numbed with ice and the stinging sensation doesn’t last long. Pull the skin tag away from the skin. There will be a stalk which attaches it to the skin. Put the edge of the scissors as close to the skin as possible, but not directly on it, as you will cut the skin. Cut the stalk quickly, and immediately apply pressure to the spot. Leave pressure on the area for a few minutes to make sure that the blood has clotted. You may want to apply an anti-bacterial gel, such as Neosporin, to avoid infection. Cover with an adhesive bandage and leave it on for the next 24 to 48 hours as it heals. Although harmless, removing skin tags yourself can still lead to complications. The skin surrounding the area could become infected, which will ultimately cause you more difficulty down the line. You should also never attempt to remove a skin tag if you aren’t 100% sure that you’ve diagnosed it correctly. The last thing that you want to do is self-treat a melanoma. If you aren’t sure, seek the expert opinion of a dermatologist. Additionally, depending on the size and position, you’ll likely experience bleeding once it has been removed. This is something that you should consider if the skin tag that you want to remove is in a highly visible area, such as the face or neck. Do you want to risk getting a scar? Is that going to look better? It’s highly unlikely. For the reasons discussed above, this method of self-treatment is discouraged by doctors. If you do decide that this is the method that you want to use, then there is one small precaution that you should follow to avoid additional complications. Make sure that the blade you use to cut the skin tag off, whether it is scissors or a razor, is adequately cleaned and sanitized. If you’ve just been cutting your toenails or trimming meat, you’re highly likely to get an infection. Make sure that the blade is sharp. When cutting, try to slice the skin tag close to the stalk while avoiding cutting the skin. Is It Safe To Cut Off a Skin Tag? You may be wondering “can I cut a skin tag off?” This could be achieved with any sharp instrument, such as scissors or a blade. In fact, it is quite common for people to accidentally remove a skin tag when shaving. Cutting off a skin tag is a quick, direct, and cost-free solution. If you’re unhappy with the presence of a skin tag, then you may have prioritized a fast result over safety. Many other skin tag removal products offer a much safer solution. We’d also recommend a natural solution, so read this post on skin tags and tea tree oil before making a decision. No pain, no scarring, and results within 3 to 6 weeks. There are many ways to go about removing skin tags. They all tend to differ in cost, safety, and treatment time. However, it is important to know that there are safe removal methods that don’t rely on a medical professional and the costs that come with it. We are a big advocate of Australian tea tree oil because it’s 100% natural, affordable, and many people have found the essential oil to be an effective treatment. It’s certainly better than cutting off a skin tag because it won’t be painful, and you’re not going to develop a nasty infection. Another popular treatment is tying off skin tags with a fine string, such as dental floss. Tying it directly around the stalk and pulling tightly cuts off the blood supply. It only takes 7 to 10 days before the skin tag turns black, dies, and falls off. But you do need to make sure that the string is wrapped around the skin tag and pulled tightly. When you remove skin tags in this way you may experience a small amount of discomfort, and there’s a risk of infection if it is not done correctly. Cutting skin tags off is popular, but those researching for the best skin tag treatment or the best skin tag removal method for the first time may wonder if it’s safe. 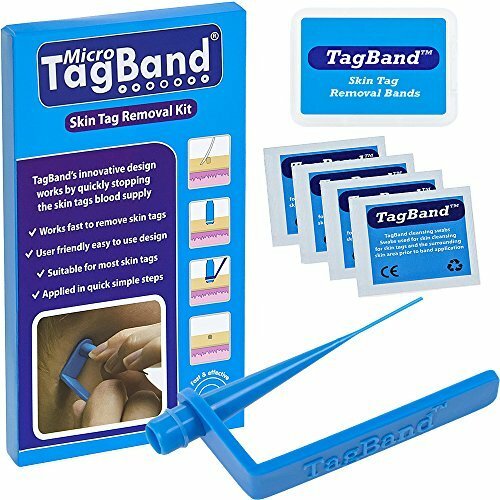 Am I better off with the TagBand skin tag removal device? If you don’t want to apply skin tag removal cream or use medical scissors, this device can get rid of skin tags in just a week. 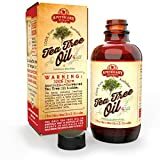 We recommend using Australian tea tree oil or the TagBand skin tag removal device as they both work and aren’t expensive. Don’t take any chances with your skin health or you may regret it. Watch the above video if you have any doubts.